With this new model, MCT pushes the boundaries of technicality with an unusual combination of a central suspended balance wheel and a traditional hours-and-minutes display. At first glance, the watch is surprising in its purity. As we discover the movement, we can appreciate all of the moving elements that rotate around the balance wheel as if in celestial orbit. In order to accentuate the effects of depth and light, the designer has played with a spectrum of colours, surfaces and finishing’s, from the most classical to the most high-tech: brushed, polished, stippled, bead-blasted, or Côtes de Genève. The palette, complemented by reflections from the embellishments creates a very brooding and masculine aesthetic. It is with this new time piece that MCT has ventured into a new creative space, one more virile and mysterious yet still rooted in an authentic quest for elegance, matched by a dash of irreverence. The iconic case, the glass curves of the body, the horns, the cross-shaped bridge and MCT’s crest complete the movement, ensuring the watch bears the aesthetic codes that this Swiss watchmaking brand is known for. This latest-generation movement, the MCT-F1.0, with its manual winding mechanism is based on an unusual creative concept, one that pays testament to a close collaboration between designer, engineer and watchmaker. With this new development, MCT pushes the boundaries of technicality with an unusual combination of a central suspended balance wheel and a traditional display of hours and minutes. From this starting point, the main challenge was bringing the escape wheel to the center by moving the transmission from under the movement into the middle. This central escapement, with its Swiss pallets, boasts a variable-intertia balance wheel married with a Breguet terminal curve – a combination that offers increased accuracy of timekeeping. Maintaining a traditional display of hours and minutes presented a second mechanical challenge; to meet these design requirements, the hands, guided by a ball bearing, are seen on the outside of the central escapement and placed on a ruby roller. This movement is equipped with a power reserve indicator as well. 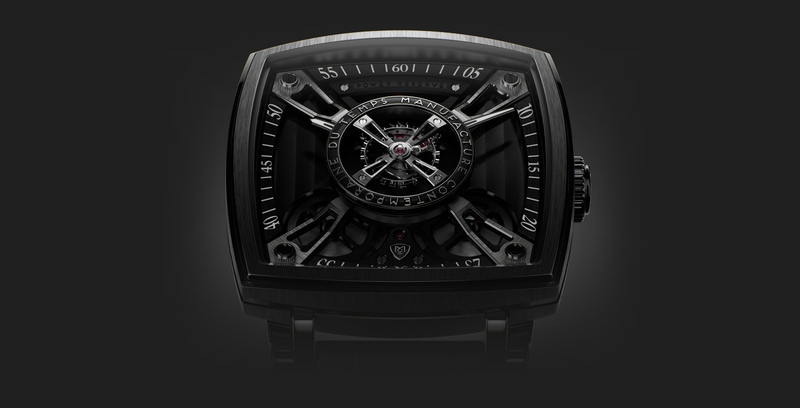 The case of the Frequential One F110 maintains a classic cushion form, with slightly smaller dimensions (42mm). Considerable mastery was required to achieve fluidity in the various layers of titanium, the line of the sapphire glass, and the light reflecting off the shimmering Côtes de Genève motif. In order to uphold the harmony of the timepiece and its ergonomics, the horns are slightly rounded on the top. Sleek and contemporary, MCT Collection represents the innovative approach of the Manufacture, whilst a traditional watchmaker spirit connects the brand to its legacy. MCT-F1.0 mechanical manual hand-winding movement, developed and assembled by MCT. Ø 33.30 x 33.30mm, H 10.00 mm. 279 components. Double barrels and central upper balance. Bridges hand-chamfered and adorned with "Côtes de Genève". Traditional Breguet terminal curve. Frequency 18,000 A/h (2.5Hz). Power reserve. 33 Rubies. 42.00 x 42.00mm, H 14.00 mm in centre and, 6.9 mm on the edges. Crafted from Titanium Grade 5 with DLC treatment. Composed of 45 parts. Front cambered crystal made of sapphire with double anti-reflective treatment. Rear crystal made of sapphire with anti-reflective on the inside side. Middle crystal made of sapphire. Dark grey dial plate adorned with "Côtes de Genève". Black dial-train made of 4 hand-chamfered appliques, white indexes and numerals. Alligator "Carbon Black", double hand stitched with anti-allergic inner leather. Double deployment clasp in Titanium Grade 5, composed of 18 parts.